Subject of the major traveling exhibition, “Looking In: Robert Frank’s The Americans,” and unanimously acknowledged today as a masterpiece of photobook publishing, Robert Frank’s The Americans occupies a privileged position in the history of photography. The communal adulation that Frank’s book now receives justly celebrates this masterwork of picture making, editing, and sequencing. The 506 page catalog for the 2009 “Looking In” exhibition is a scholar’s delight of detail on Frank and the The Americans. 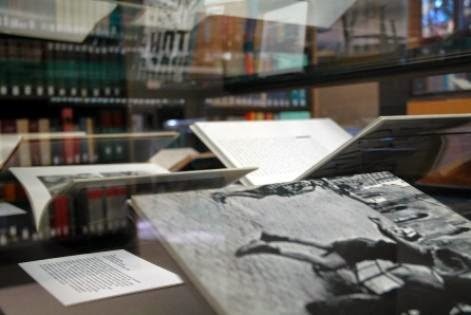 Yet the sum effect of this recent attention may actually diminish our ability to perceive the book’s relative position within the larger culture of American photography at the time of its appearance in January 1960. We assume that the considerable influence of Frank’s The Americans today was also broadly shared in 1960, that the book’s impact was immediate and overshadowed all else in American photographic culture. Actually, whileThe Americans was a bombshell in some quarters, it caused barely a stir in others. The range of photographic practices under consideration by American photographers in the late 1950s and early 1960s was remarkably diverse. It is this array of practice, and the possible role of The Americans within that array, which is the subject of this exhibition. When The Americans was released in the United States in 1960 the book was generally ridiculed. The now infamous seven reviews published in Popular Photography (May, 1960) varied from a few brief notes of support for the Swiss-born Frank’s “strong viewpoint” to shared outright denouncement of his apparently anti-American stance and his “contempt for any standards of quality.” Following the book’s appearance Frank did receive exhibitions at the Art Institute of Chicago (1961) and the Museum of Modern Art (1962), but with its portrayal of alienation and the photographs’ unconventional styleThe Americans did not sell well. It was not widely known until 1968/1969 when new editions were released by Aperture. “More than Robert Frank’s The Americans” pursues a nuanced understanding of the multiple tendencies under consideration by American photographers. Starting with all three books reviewed in that 1960 issue of Popular Photography, the exhibition examines the literature of the period and the manner in which various conceptions of and approaches to photography were disseminated and supported by that literature. The exhibition also glimpses a commercial photographer’s archive and raises the question of how the advanced amateur/commercial realms related (or didn’t) to the art photography world of Frank and his peers. Surveying the multiple fields of 1950s and 60s American photo culture, “More than Robert Frank’s The Americans offers a number of avenues towards a broader appraisal of American photographic practices of that era, and suggests that the literature itself should provide significant direction for these investigations. The photographs in The Americans were shot during Frank’s 1955-1956 Guggenheim Foundation funded road trips. A selection of the Guggenheim work was first published in the U.S. Camera Annual in December, 1957, with a supportive introduction by Walker Evans and a “Statement” by Frank. The pictures selected for the Annual did not project such a dour image as those chosen for The Americans, and with no title intimating a link to “America” as subject, Frank’s photographs in the Annual did not draw the sharp criticism they would later in The Americans. The Guggenheim work first appeared in book form in Europe as Les Americains (Paris: Robert Delpire, 1958). In late 1958 Barney Rosset of Grove Press agreed to print a U.S. edition, which was released in January, 1960, with the same picture selection and editing but with a new text written by Jack Kerouac. In the May, 1960 Popular Photography review section that lambasted The Americans, two additional photobooks were also reviewed. One was a how-to guide by Ozzie Sweet, My Camera Pays Off, reviewed by Arthur Goldsmith, who praised the book and Sweet. Goldsmith referred to Sweet as “ebullient,” “with a tremendous backlog of experience,” and the book as “brash, direct, sharply focused, full of human interest.” In the same review section Goldsmith characterized Frank and The Americans as “marred by spite, bitterness, and narrow prejudices just as so many of the prints are flawed by meaningless blur...and general sloppiness.” The other book reviewed, London, a typical travelogue by Jacques Boussard, received two sentences by John Durniak and was not considered noteworthy beyond its “beautifully reproduced” pictures. Durniak is far more opinionated on Frank and The Americans: “Overall he has created…a wart-covered picture of America.” By closely examining these publications and analyzing the critical reception of The Americans against Sweet’s My Camera Pays Off and Boussard’s London, traditional tendencies inherent in American photo culture of the late 1950s and early 1960s and Frank’s paradigm breaking practice are more clearly differentiated. While no single document or publication can suggest the range of photographic practices in play during the 1950s and 1960s, when gathered together the literature functions as an archive revealing the conventions engaged in by the photographic community. These precepts extended from the normative to the novel, and their codification in the literature provided opportunities for innovative, paradigm breaking responses. While photography books, art photography journals, and photo exhibitions were still relatively scarce in the 1950s, when compared to the preceding decades of the 30s and 40s there had been significant growth in the number of institutions and publications that supported photography. As sites in which notions of photographic practices were articulated, debated, and disseminated, these publishing and exhibiting venues were of tremendous importance to the American photographic community. Collectively they encouraged an increasingly diverse range of photographic tendencies, especially for those practicing photography as fine art. For “More than Robert Frank’s The Americans” five publications were selected to introduce this expanding range of exhibition venues and publication: Edward Steichen’s Family of Man catalog, a Minor White edited issue of Aperture magazine, a single volume of from the hugely important photographic annual literature, International Photography Yearbook 1960, a second photo journal, Contemporary Photographer, and Beaumont Newhall’s Photography at Mid-Century catalog from the George Eastman House. One of the watershed moments for American photography in the 1950s was the “Family of Man” exhibition (1955), curated by Edward Steichen for the Museum of Modern Art and billed as “the greatest photographic exhibition of all time—503 photographs from 68 countries.” Robert Frank (with seven photographs) was one of the 257 photographers shown. Steichen’s intent for the exhibition was ambitious and populist, the presentation of a message of universal kinship. Although embraced wholeheartedly by the public, many photographers felt that Steichen had sacrificed creative photography and the original contexts of their photographs on the cross of his own editorialized and humanistic personal opinions. Frank himself stated, “I have a genuine distrust...[of] all group activities. 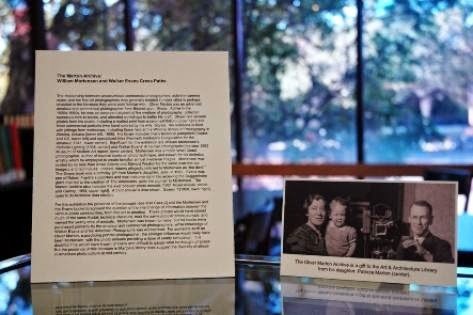 Mass production of uninspired photo journalism and photography without thought becomes anonymous merchandise.” Regardless of what the photographic community thought, by 1962 “Family of Man” had made ninety-one stops in thirty-eight countries and had been seen by over 9,000,000 people. The emerging model of the “concerned photographer” as presented by the exhibition and book suggested a new ideal for those wishing to portray issues of human welfare and dignity. Perhaps the best publications regularly showing the multiplicity of photographic practices during this period were the photography annuals, including International Photography Yearbook, U.S. Camera Annual, Gallery, etc. These annuals included portfolio sections by well-known photographers, the best of the “picture press,” photo essays, and the always popular “technical” section, where amateurs could hope to discover the secrets of the professional. Filled with examples of fine art photography, candid street images, portraiture (celebrity and otherwise), eyewitness snaps, travel shots from around the world on and off the beaten path, abstract images, and, of course, nudes, kitties, and assorted schmaltz, the annuals presented an A-to-Z documentation of who was doing what—at least according to the editors who selected the photographs. While Frank is not included in this particular annual, his work did appear in others. Another important but shorter-lived journal than Aperture was Contemporary Photographer (1960-1968). Occasionally doubling as an exhibition publication, this particular issue served as the catalog of the Museum of Modern Art exhibition, “The Sense of Abstraction.” Whether derived from a Constructivist/Cubist geometricizing which distilled form, or a Surrealist-inspired totemizing which suggested associative symbols, some photographers had always pursued abstract photographic imagery. With the success of the American abstract painters in the 1950s, photographs that wed photography’s ability to depict abstract forms with inferred subjectivist content became increasingly prevalent. “The Sense of Abstraction” exhibited eighteen photographers, including Francis Bruguiere, Lennart Olson, Val Telberg, Naomi Savage, Wynn Bullock, Nathan Lyons, and Edward Weston. Jaromir Stephany, shown here, was a student of Minor White’s at the Rochester Institute of Technology in the 1950s. He was an avid proponent of abstract photographic work and taught photography at the University of Maryland Baltimore County from 1973 until his death in 2010. 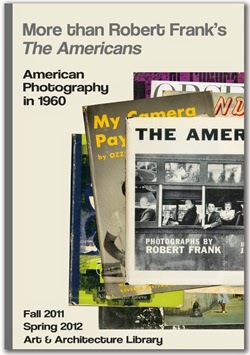 Although the release of the 1959 Grove Press edition of Robert Frank’s The Americans is often considered in and of itself a high point of mid-20th century American photography, it was the concurrent publication of a number of equally significant titles that signaled a defining moment in American photography and established the photobook as a viable and elastic format for photographers to explore. Key among these publications is Aaron Siskind: Photographs (1959), Richard Avedon’s Observations (1959), Sid Grossman’s Journey to the Cape (1959), and William Klein’s Rome (1960) . The shared importance of these works is their presentation and articulation of a cohesive body of work in the photobook format. They clearly identify a shift from a perception of photography as shared fact to photography as personalized experience. The social or artistic significance of what was pictured in the work is now leavened by another consideration, the photographer’s ability to work within the realized artifice of the photograph to create a new type of document based upon the photographer’s probing of a wholly subjective and photographic moment. 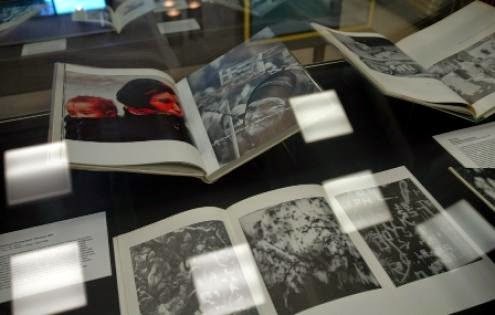 Gift of the Grape is not considered an innovative exemplar of the American photobook. The primary purpose of the photographs is to illustrate the author’s text. Yet it serves as a good example of how a photographer’s work was typically published in 1959. All photographers must pay their bills and commercial photography was the common means by which photographers earned an income. 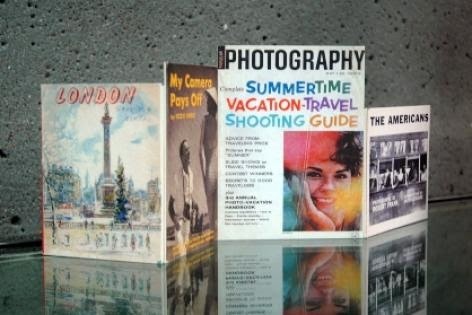 Although it is difficult for us now to consider a time when there were few photo galleries, when museums seldom collected photographs or gave photography shows, and when photography books were a novelty, this was, in fact, the case in the late 1950s. One of the few means a photographer had to earn a steady income was by partaking of regular commercial work and magazine assignments. Today an Ansel Adams print will sell for tens, even hundreds of thousands of dollars. But in the 1950s even a successful photographer like Adams regularly undertook commercial assignments. With his former California School of Fine Arts student, Pirkle Jones, Adams photographed on assignment the Paul Masson champagne cellars of Saratoga, CA, in 1958-59. Out of that work came a United States Information Service touring exhibition, “Story of a Winery,” and this book, Gift of the Grape. With an essay by the American art writer Harold Rosenberg, Aaron Siskind: Photographs is not the first photobook to appear with a text by a noted critic of its era, but it was rare for a photobook’s essay to foreground the notion of photography as an artistic practice and analyze that practice from an art historical perspective. What also made the Siskind book stand apart was its design by Siskind and Ivan Chermayeff, its presentation of a limited aspect of a photographer’s output as a cohesive body of work (1944-1955), Siskind’s effort to create photomechanical reproductions that functioned as true surrogates of the original prints, and ultimately, the critical impact of the book. Although sales were negligible, it was widely reviewed in the photographic and popular press (New York Times, Aperture, Art News, Times Literary Supplement, Image). Rosenberg’s essay, titled “Evidence,” and the difficulty with which he engaged the issues of reproduction and originality, painting and photography’s relationship to one another, and Siskind’s particular approach to photography versus what Rosenberg describes as “boy and his dog” photography, tellingly reveals the uncertainty and unease with which the high art establishment considered photography. While Frank’s The Americans is now looked upon as initiating a new photographic practice based on the aggressive exploration and structuring of banal, everyday visual information, Avedon’s work inObservations reveals an equally tough, uncompromising, and original sensibility at play. The Americans’s flow of consciousness is countered by Observations’s staccato pace, yet both books are profoundly authorial, each clearly and unreservedly the product of an intensely focused and personalized photographic aesthetic. Each book displays an insistent psychological examination of subject matter and foregrounds the photographic concerns of their authors. 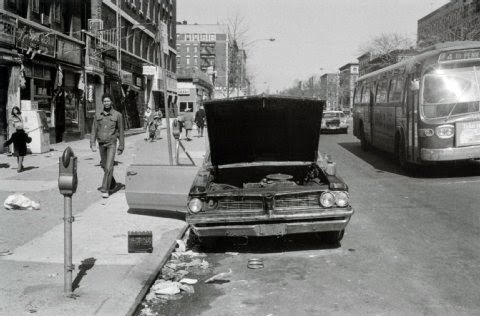 The Americans, firmly rooted in the tradition of Walker Evans’s engagement with the vernacular, and intensifying the dispassionate stance of the photojournalist, marked a tipping point after which the work of a photographer such as Garry Winogrand seems inevitable. Avedon’s Observations, with origins in the great fashion photographers, modified by an almost Bauhausian media experimentality and inventiveness, and informed by the great stylistic examples of Martin Muncaksi and Alexey Brodovitch, points towards the work of Diane Arbus. As a founder and one of the major photographers and teachers associated with New York’s Photo League (and later as a private teacher) Sid Grossman’s influence on the New York photo scene of the 1940s and 1950s was immense. An exponent of socially instrumental photography in the early years of the League, Grossman and the League fell afoul of the FBI and the McCarthy era witch hunts of the late 1940s. Prior to the disbanding of the League in 1951, he began a series of private evening workshops at his apartment. During the summers of 1947-48 he photographed a Coney Island beach known as Bay Eleven, a public beach area frequented by the Latino youth of the city. These photographs, along with earlier work from Panama and later work from Cape Cod, were published in Journey to the Cape. The book also included color photography, at that time considered the domain of only the amateur and commercial photographer and infrequently photographers such as Grossman. Despite Grossman’s importance, there is no major monograph or exhibition catalog on his career and work. The relationship between amateur and local commercial photographers, active in their local camera clubs, and the fine art photographers who generally resided in major cities, was much different in the 1950s and 60s than it is today. Due to economic necessity most who pursued photography as a fine art also engaged in purely commercial work (see Gift of the Grape, Ansel Adams and Pirkle Jones, 1959, in Case 3, "The New Photobook"). Yet most commercial photographers were little concerned with fine art photography. Such broad distinctions are, of course, inevitably flawed and this realm is ripe for additional research. It is perhaps in the literature that amateur, commercial, and fine art photographers collected and were all familiar with that profitable investigations could begin. Oscar Marton was an advanced amateur and commercial photographer from Bloomington, Illinois. Active in the 1930s-1960s, he was an observant student of the medium of photography, collected numerous how-to books, and attended workshops to better his craft. In this exhibition are a matted print from a salon exhibition and three commercial portraits (two hand colored by his wife, Signe). His notebook is filled with jottings from workshops, including those held at the Winona School of Photography in Winona, Indiana . His library included many technical pamphlets and specialized titles (e.g., Kenneth Heilbron’s Composition for the Amateur 1941). Significant for this exhibition are William Mortensen’s Pictorial Lighting (1935) and Walker Evans’ American Photographs (1938, reprinted 1962). Mortensen was a noted West Coast photographer, author of several books on photo technique, and known for his technical artistry which he employed to create fanciful, almost medieval photos. Mortensen was reviled by no less than Ansel Adams and Edward Weston for this over-the-top imagery and techniques. Indeed, Adams allegedly referred to Mortensen as “the devil.” The Evans book was a birthday gift to Marton from his daughter, Julie, in 1962. Evans was a key supporter of Robert Frank and instrumental in Frank receiving the Guggenheim grant that led to the creation of The Americans – quite the counter to Mortensen. The Marton Archive also includes the ever popular photo annuals (including the Rollei annual and Gallery), within which the works of fine art photographers, journalists, and commercial photographers were intermixed. For this exhibition, the presence of the annuals alongside Mortensen’s Pictorial Lighting and Evans’ American Photographs foregrounds the question of the interchange of information between the various photo communities, from amateur to art. These groups would have shared much of the same technical literature, read the same popular photo journals, and viewed the yearly crop of annuals. Mortensen was known to many, his books purchased primarily by the amateur and commercial photographers, while Walker Evans and his American Photographs was influential in the art community. For someone such as Oscar Marton, a practicing portrait photographer, the stronger influence would likely have been Mortensen, with the photo annuals providing a yearly dose of stimulation. It is doubtful if he would have known of Frank and difficult to gauge what he thought of Evans. But the presence of this literature in Marton’s library does suggest the diversity of stimuli in American photo culture at mid-century.